Key difference: The Alcatel One Touch Idol Ultra features a 4.65 inch HD AMOLED capacitive touchscreen with a resolution of 720 x 1280 pixels. The phone is powered by Dual-core 1.2 GHz processor on a MediaTek MTK 6577 and 1 GB of RAM. The phone has a width of 6.45mm, which has led the company to tout it as the thinnest smartphone on the market. 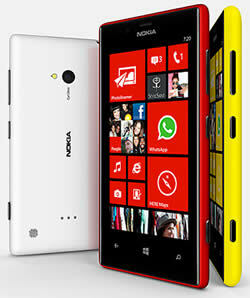 The Nokia Lumia 720 is one of the newest phones that are similar to its flagship Lumia 920. The Lumia 720 comes with 1 GHz dual-core Snapdragon S4 processor with 512 MB RAM and 8 GB internal storage space that is upgradeable to 64 GB. The Lumia 720 comes with 1 GHz dual-core Snapdragon S4 processor with 512 MB RAM and 8 GB internal storage space that is upgradeable to 64 GB. It also offers Corning Gorilla Glass 2 for protection purposes. The phone is available with a 6.7 MP primary camera with Carl Zeiss optics, autofocus and LED flash. It also has a 1.3 MP secondary camera with a resolution of 1280 x 960. The company offers many camera features such as touch focus, landscape orientation, auto and manual exposure, auto and manual white balance, still image editor, full screen viewfinder, Cinemagraph lens, Bing vision, Smart Shoot lens and panorama lens. The Smart Shoot lens allows the users to merge two different photos to create a perfect shot, which comes handy, if you don’t like having to tell people pose in front of the camera. The phone is slick and thin bar phone with slightly curved edges. The phone sports a 3.5mm jack on the top, with camera button, volume button and the sleep/wake button on the right hand side. The back also three tiny holes for a Wireless Charging cover, which fits on the back of the device. The phone is customizable with changing shells, making it easier to mix and match the phone with various different colors. The phone has been announced for the Australian market, with launch dates yet to be released for the rest of the world. The information for the detailed table about the two phones has been taken from the Alcatel One Touch Idol Ultra website, from the Nokia website, techradar.com and GSMArena.com.